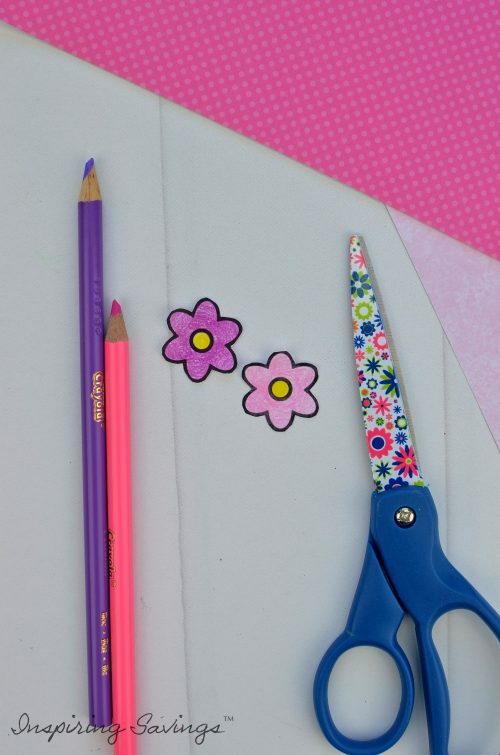 This is Heartwarming DIY Mother’s Day Card that your kids can actually make! A great craft to celebrate moms and grandmas! 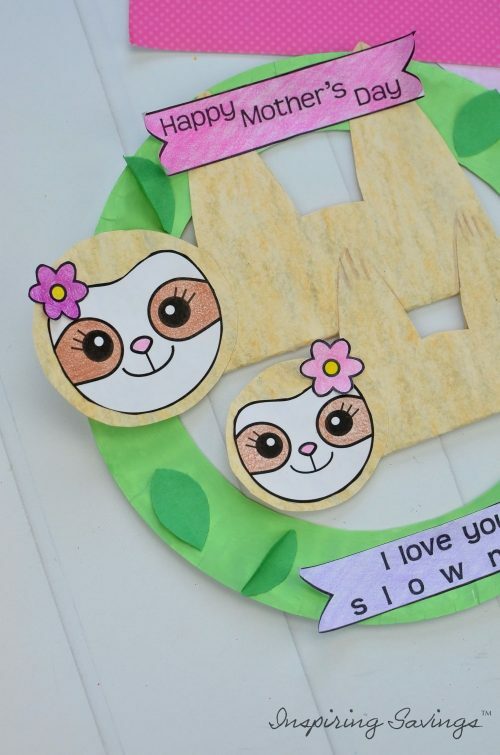 Sleepy Adorable Sloths pair perfectly with a homemade paper plate wreath. No need to spend big bucks on the perfect Mother’s Day Card from the store. Instead, your little ones can create something memorable and super adorable. Sloths are all the rage right now! Bet you didn’t know that. They just scream; “Look at me, I am so cute”. If of course, they could scream, but instead they just move slowly. HEY!! Does that sound like your children in the morning when you are trying to rush them off to school? Yep, I was thinking the same thing. It does! This card is just so perfect in so many ways. Before getting started I am very much a visual person, so I assume everyone else is too. I have many pictures to help you create your very own card. Plus pictures do easily help little one find there next step. And while your little make this card you can share with them some FUN sloth facts. Like for instance; why they are so slow. The card parts are provided as a free printable and the rest is assembled with some everyday items around the house (that’s how we roll!). At the very bottom of this post, you print out these instructions as well. Print your Mother’s Day Card Template here! First, let’s start with the paper plate. You are going to need to fold the plate in half and cut out the center circle, leaving just the border for the wreath shape. Now paint the paper plate light green, I combined regular green and white to make light green. 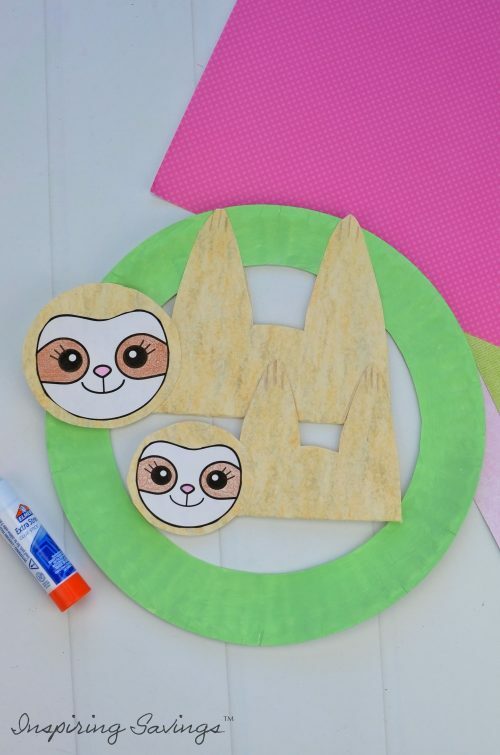 While your paper plate wreath dries, cut out the Mommy and Baby sloth bodies from your printed template. Once cut out then trace out the body templates on to tan or brown construction paper and cut out. See images above. You are now, ready to cut the Mommy and Baby sloth heads out. Color the eyes and faces with the colored pencils. Your choice of colors, but I matched the bodies by using a light brown. Now trace the heads onto tan or brown construction paper. 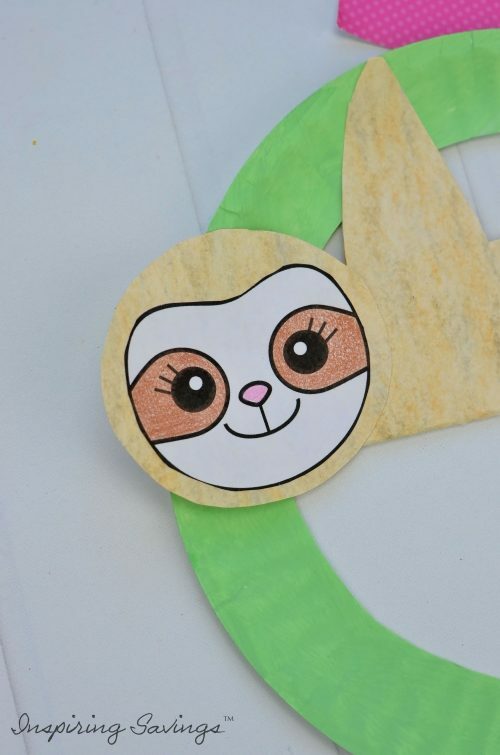 Cut out the construction paper circles and cut out the face shape from the sloth heads. Finally, glue the sloth faces to the construction paper heads. 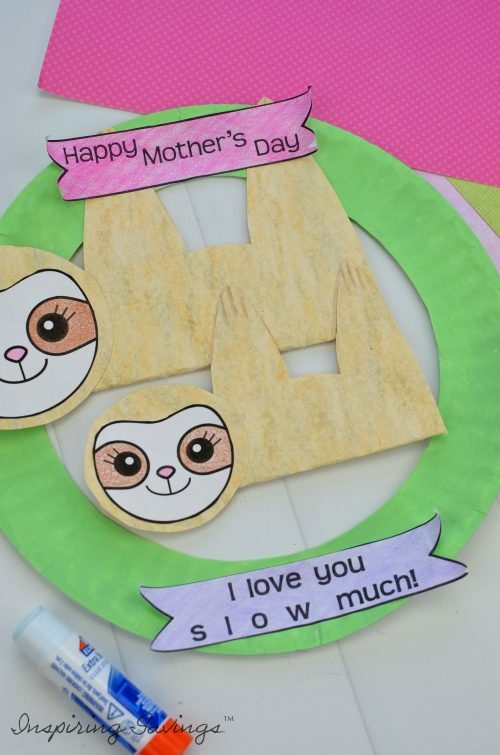 To start assembling the Mother’s Day Card Sloth Craft, take the Mommy sloth body and fold it in half hotdog style so the hands are touching each other, and the feet are touching each other. Now, place the sloth body on the top of the wreath so it looks like it’s hanging down. Put a bit of glue stick on each hand and foot to secure the Mommy body to the plate. Then complete the Mommy sloth by gluing on the head. Repeat this same process with the baby sloth, attaching the arms and legs to the Mommy’s body instead of the paper plate. Now is the time to get excited over this Mother’s Day Card. As it is pulling together you are seeing the cuteness in front of your eyes. Let’s jazz up those sloths. Time to give your sloths some accessories by adding the bows or flowers to their hair. 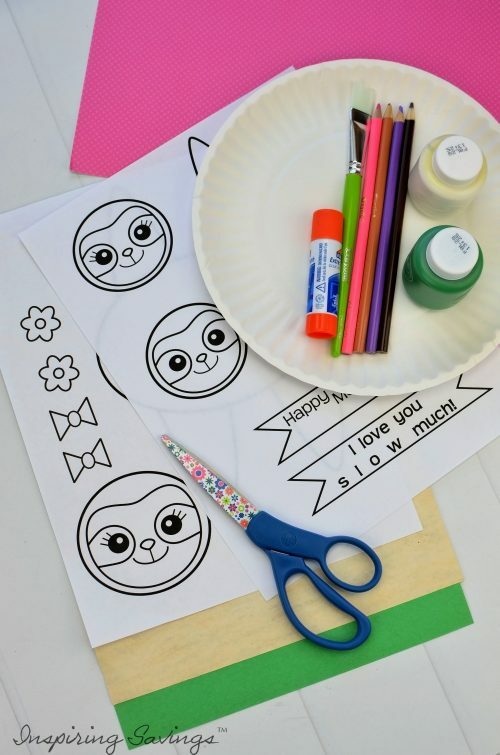 Simply color, cut and glue them to the top of each sloth’s head on your Mother’s Day Card. To add a little detail, use a brown colored pencil to add some nails to the end of each arm and leg. You will see more of this detail on the baby sloth. Now you are ready to color and cut the banners. Pick your favorite colored pencils. Once done glue them to the top and bottom of the plate. Next, take the green construction paper and fold it in half 3 times, rotating the direction of the fold every time. Draw two leaves. Yes, you are going to be free handing this part. Leaves are so different and do not need to be perfect. 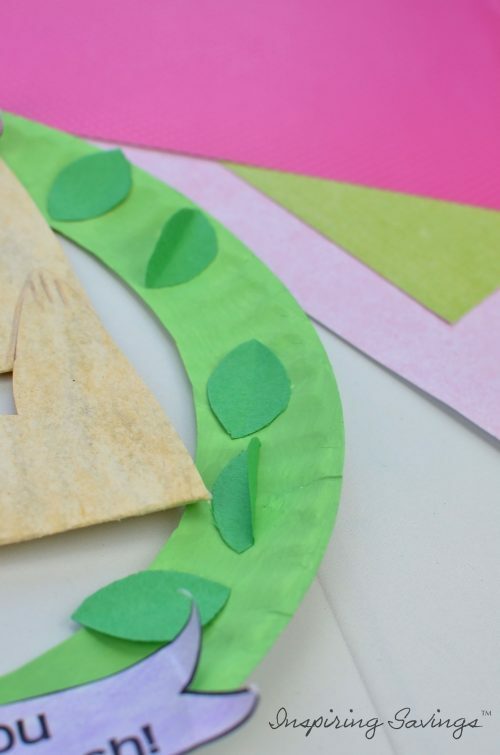 After that, cut out your leaves (going through all the layers of the construction paper). Take each leaf and fold it in half to give it a 3D effect. Glue the leaves around the plate in a random pattern to finish the craft. No need to place them in any certain order. For instance, place some “upside down” or “backward”. This will give it more of a personalized look. 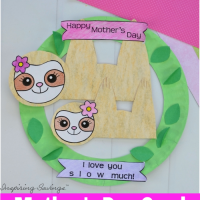 Finally, your Mother’s Day Card sloth wreath is ready to hang! Your mama’s heart is going to just melt over all your efforts. This card is proof that you do not need lots of money to give a card that is filled with love, compassion, and appreciation. That being said, I hope you have a wonderful Mother’s day. First fold the plate in half and cut out the center circle, leaving just the boarder for the wreath shape. 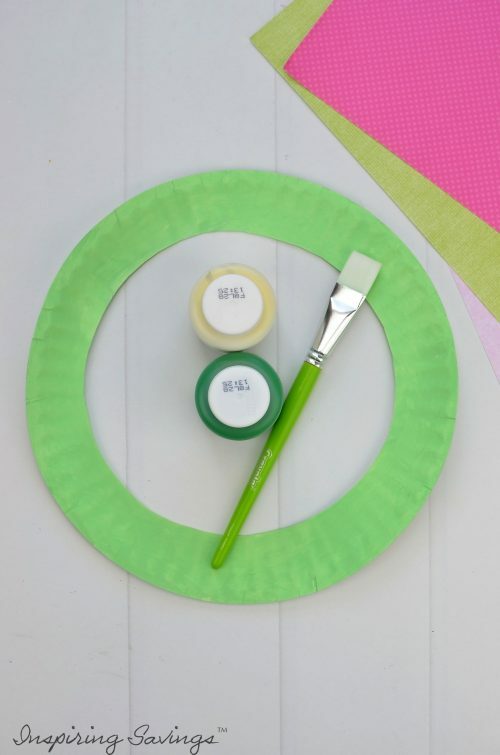 Now paint the paper plate light green, I combined regular green and white to make light green. While that dries, cut the Mommy and Baby sloth bodies out of the template. 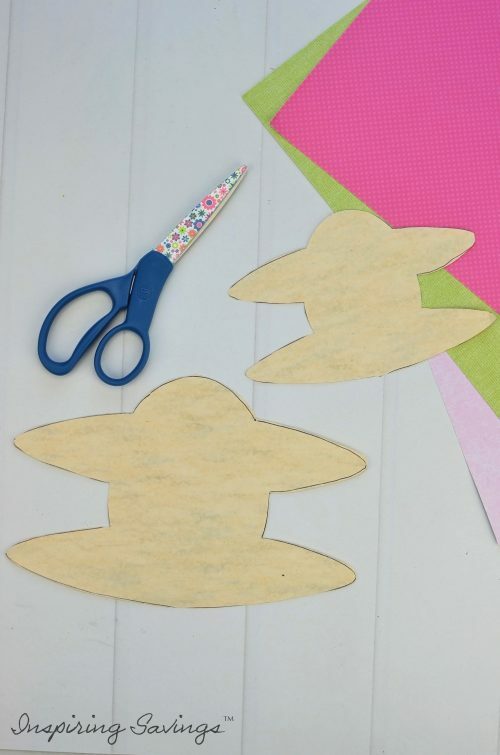 Trace the body templates on to tan or brown construction paper and cut out. Now, cut the Mommy and Baby sloth heads out. Color the eyes and face shape with the colored pencils. Now trace the heads onto tan or brown construction paper. 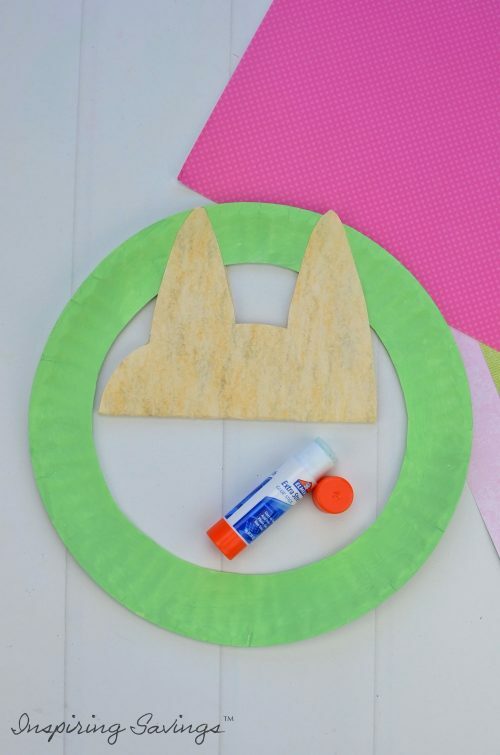 Cut out the construction paper circles and cut out the face shape from the sloth heads. Finally, glue the sloth faces to the construction paper heads. 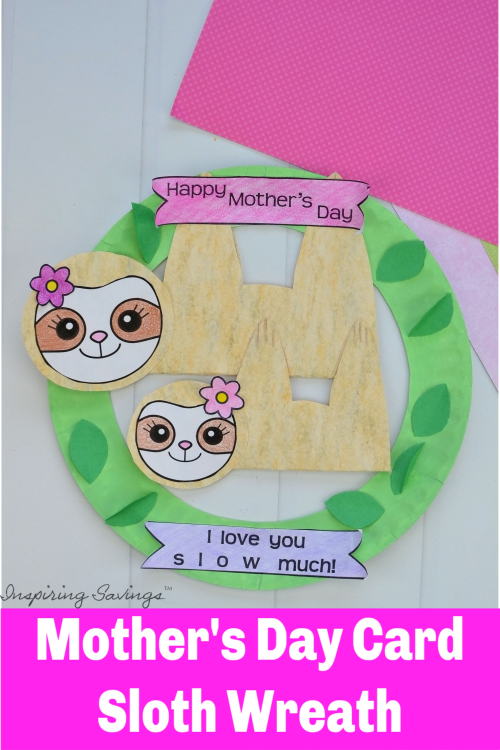 To start assembling the Mother’s Day Sloth Craft, take the Mommy sloth body and fold it in half hotdog style so the hands are touching each other, and the feet are touching each other. Now, place the sloth body on the top of the wreath so it looks like it’s hanging down. Put a bit of glue stick on each hand and foot to secure the Mommy body to the plate. Then complete the Mommy sloth by gluing on the head. Give your sloths some accessories by adding the bows or flowers to their hair. 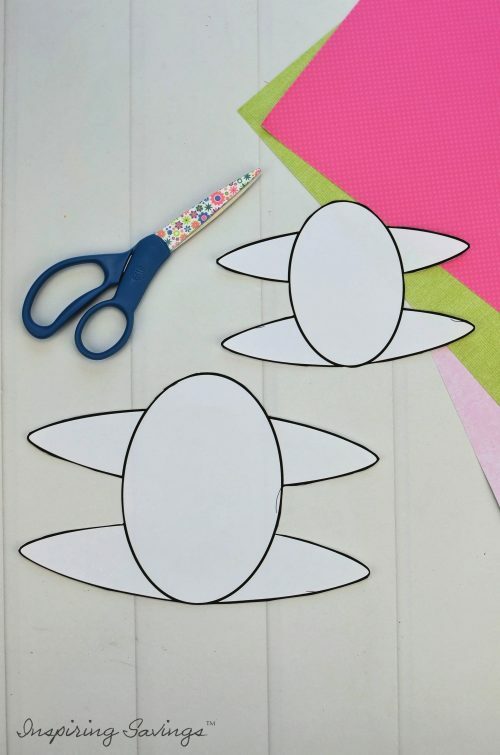 Simply color, cut and glue them to the top of each sloth’s head. To add a little detail, use a brown colored pencil to add some nails to the end of each arm and leg. Then, color and cut the banners. Glue them to the top and bottom of the plate. Next, take the green construction paper and fold it in half 3 times, rotating the direction of the fold every time. 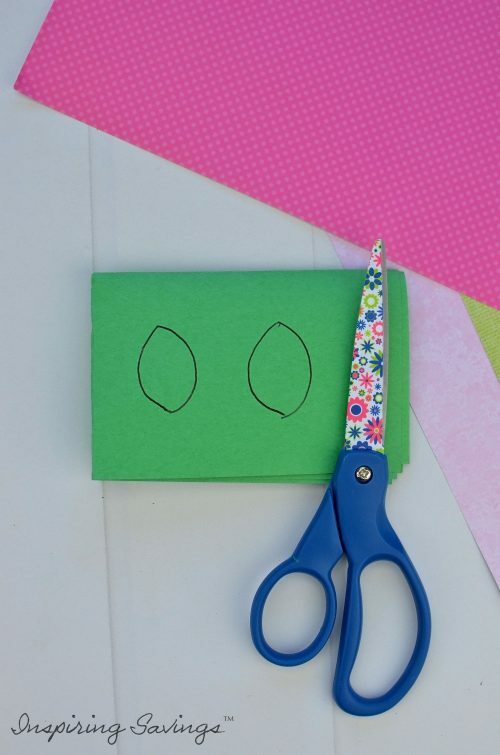 Draw two leaves and cut them out (going through all the layers of the construction paper). Take each leaf and fold it in half to give it a 3D effect. Glue the leaves around the plate in a random pattern to finish the craft. The Mother’s Day sloth wreath is ready to hang! Happy Mother’s Day, Moms are the best! Awe. Thanks So Much Michelle!! !